What is the Global Entrepreneurship Summit 2019? · On 4 and 5 June 2019, the United States and the Netherlands will co-host the 9th ‘Global Entrepreneurship Summit’ – the GES 2019. · GES is a unique international platform where entrepreneurs can present their innovative solutions to global challenges. GES will create an environment that fosters innovation, empowers entrepreneurs, engages investors, and leads to concrete business deals. It is an atmosphere and market place through which ideas are supported and brought to action. · Over the course of two days, participants will engage with leaders and representatives from the global community engaged in entrepreneurship and build connections that transform ideas into enterprises. The programme will feature a variety of keynote sessions from top speakers, expert sessions that address key business challenges and innovative, forward thinking matchmaking activities. · GES is the preeminent annual entrepreneurship gathering that convenes emerging entrepreneurs, investors, and entrepreneurship supporters from around the world. As such, GES offers a unique and international platform to bring innovative companies in contact with foreign investors. GES allows entrepreneurs to pitch their ideas, expand their networks, build partnerships, and secure funding. It is a space for investors to engage with other investors and discover emerging talent. GES serves as a platform for governments and private sector organizations to promote new policies and initiatives. · An estimated 20,000 emerging leaders have participated in Global Entrepreneurship Summits since 2010. Relationships formed at these summits have transcended borders, industries, and sectors and have led to investment opportunities, partnerships, and successful enterprises. · At previous GES summits, governments and the private sector have committed over $1 billion in new capital to entrepreneurs worldwide. For early stage entrepreneurs, these commitments have resulted in resources, trainings, and platforms to learn from and connect with others. More established entrepreneurs have benefitted from investor commitments to fund and scale their businesses globally. · Before, during, and after the summit, a number of events affiliated to GES will be organised in the Netherlands, the US and the rest of the world to maximize participation opportunities. Why is GES 2019 taking place in the Netherlands? · Following a meeting that took place between President Trump and Prime Minister Rutte in Washington on July 2 2018, the decision was taken to host GES 2019 in the Netherlands. GES stands as an example of how the Netherlands and the United States strongly encourage entrepreneurship and innovation worldwide. The unifying principles of our transatlantic relationship reinforce how the bond between our two countries can produce economic growth, fair trade, and large direct investment. · Previous GES editions were held in Washington, Turkey, the United Arab Emirates, Malaysia, Morocco, Kenya, Silicon Valley, and India. It is therefore the first time that the event will be hosted by a country within the European Union. What is the purpose of GES 2019? · The primary aim of GES is to promote entrepreneurship worldwide. In support of this, GES offers a unique and international platform where the innovations of entrepreneurs from across the globe can be showcased to an audience of foreign investors, presenting their tech solutions to global challenges. · GES brings together some of the smartest entrepreneurs and successful investors from around the world to create an environment that fosters innovation, empowers entrepreneurs, and leads to concrete business deals. GES equips entrepreneurs with the tools to take their ideas to the next level, and in doing so, to connect with and secure investment opportunities. Additionally, investors and companies have dedicated millions of dollars at past GES summits to support entrepreneurship activities at all levels, both within the United States and around the world. Connections made at past GES summits have resulted in hundreds of millions of dollars in investments. · GES presents itself as an opportunity for the Netherlands to reinforce its ties with the United States and to assert its position as Gateway to the rest of Europe. · GES offers the Netherlands the opportunity to promote its interests in and support for, entrepreneurship and innovation. · The GES campaign will demonstrate the Netherlands’ ability and unique approach to effectively bring industry, government and knowledge institutions together to cooperate on finding solutions to global challenges. For whom is the GES 2019 intended? · GES is aimed at supporting next generation entrepreneurs and international companies and institutions who offer innovative solutions to social challenges. · GES will comprise 1,200 entrepreneur participants from: the US (400), the Netherlands (200), Europe (200), and the rest of the world (400). There will also be approximately 400 investors from all over the world and 400 thought leaders and government officials will be present. The total number of participants is around 2,000. There are around 175-250 journalists expected. · In an effort to make GES a truly inclusive event, those who take part in it will not be required to pay an attendance fee. Those who want to participate have to apply in advance. In order to qualify to take part in GES, entrepreneurs must meet criteria. · From December 17 2018 until January 30 2019 interested entrepreneurs can register online to participate in GES at www.ges2019.org. What are the selection criteria for entrepreneurs? What is the theme of GES 2019? · The sectors that have been chosen reflect industry areas in which the Netherlands has proven to have a strong and unique track record: Agriculture, Connectivity, Energy, Health and Water. Job creation and access to finance will serve as the two main overarching themes of the summit. · GES is more than an event. It’s an annual gathering where solutions are discussed, connections are made, and outcomes are achieved. This year, GES will develop a creative approach to discussing challenges faced in each of the industry sectors and then showcase solutions. 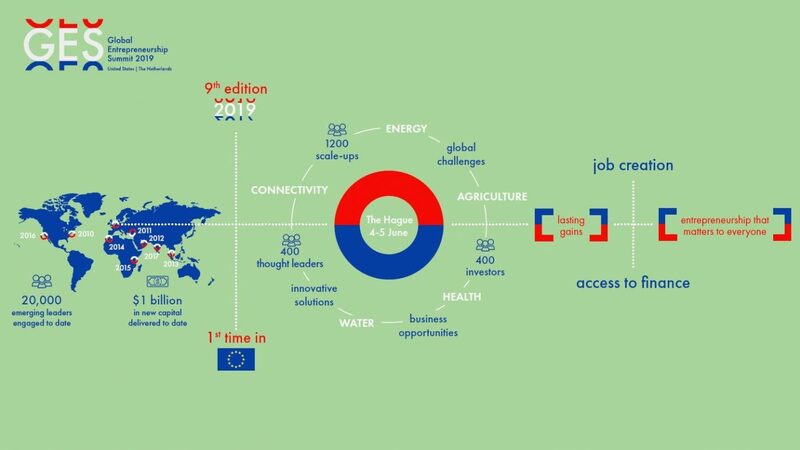 How does the Dutch and EU Business community benefit from GES 2019? · GES will bring around 2.000 international entrepreneurs, investors, corporates, scientists, thought leaders, government officials and journalists to the Netherlands. This will provide Dutch entrepreneurs with the unique opportunity to interact and build relationships with potential partners and investors from leading industries across the globe. GES itself is a link between governments and the private sector. At GES 2016 in Silicon Valley, investors, foundations, and venture capital firms announced millions of dollars in commitments to support entrepreneurs throughout the world. These groups also committed to training and new research initiatives. · 200 Dutch and 200 EU entrepreneurs will have the opportunity to participate in GES. · In order to increase the impact of GES, both during and after the summit GES will be affiliated to a number of events organised across the Netherlands.